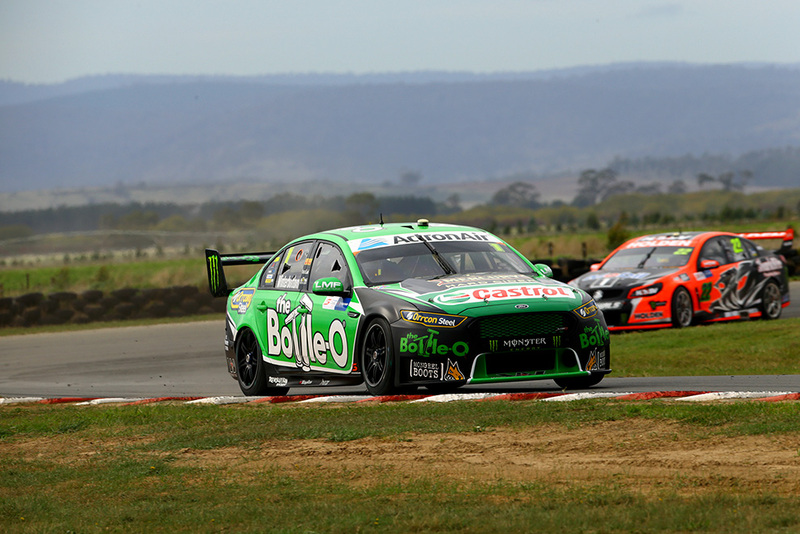 Prodrive’s Mark Winterbottom continued his fine form at Symmons Plains by topping the third and final practice session ahead of qualifying. The Friday practice pace-setter proved the fastest of those to make a late run in this morning’s 15 minute session on good quality soft tyres. Set with just 30 seconds left on the clock, Winterbottom’s 51.098s is the quickest time of the weekend to date. Track conditions were notably different from Friday, with the sun shining and the wind considerably lighter. Scott McLaughlin’s Volvo ended up 0.13s adrift in second, despite finding traffic on the second lap of his final run. Fabian Coulthard was third, showing the first sign of front-running pace from DJR Team Penske after missing out on a green tyre effort due to an ill-timed set-up change yesterday. Jason Bright spent time at the top of the order in Practice 3 on his way to fourth ahead of Lee Holdsworth, Craig Lowndes, Cameron Waters, Garth Tander, Chaz Mostert and David Reynolds. Mostert and Jamie Whincup, who ended up 18th, both bedded in fresh engines after unscheduled post-practice changes. “We noticed in the data that he was a little bit down on straightline speed,” said Prodrive team principal Tim Edwards. Red Bull team manager Mark Dutton also described the change on Whincup’s car as a precautionary measure. “There was a little bit of aluminium in the filter (after practice), which is not normal,” he said. Waters’ run to seventh meanwhile included an early brush with Nick Percat; the two cars making minor side-to-side contact at Turn 6 as the Ford driver moved down the inside of his Holden rival. Qualifying will take place from 1435 local time.